If you’d like to grow your following as quickly as possible, you can also leverage Twitter’s advertising platform. Twitter Advertising allows you to promote Tweets, accounts, and even trends to bring your message to a larger audience. The Summary Card is mostly used for articles. This card enhances Tweets with the title, description, thumbnail photo, and Twitter account attribution. The Photo Card enhances Tweets with a large photo. You’ll find that most Tweets from the popular photo sharing website Flickr are set to use the Photo Card. The Gallery Card enhances Tweets with a gallery of photos. The App Card enhances Tweets for mobile users by directing them to specific mobile apps. The Player Card enhances Tweets with a media player for videos, slideshows, and other rich content. You will find that most Tweets from the popular video sharing website Vimeo are set to use the Player Card. 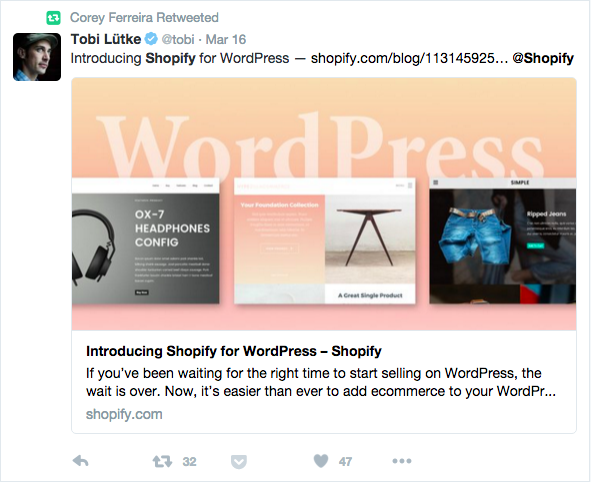 Twitter Cards offer a much richer experience for your audience and prompts different actions beyond liking and retweeting. To get started with Twitter advertising, sign up on the Twitter advertising page. If it’s your first time there, you’ll be asked to login to your Twitter account, select your country from a dropdown list, and set your time zone. Name your advertising campaign and give it a start date. Define the advertising campaign based on the objective you have chosen. Define your target audience by location, gender, language, device, keyword, followers, interests, and behavior. Tailored audiences are those you have chosen by uploading a list of emails (such as your current customer database) or by adding tracking code to your website so that you can target Twitter users who have previously viewed your website. Set your advertising campaign budget and choose whether to allow Twitter to automate your bidding amount or choose a fixed maximum amount per bid. Your campaign will begin shortly after completing these steps. Now, let’s look at the specifics for each advertising objective. 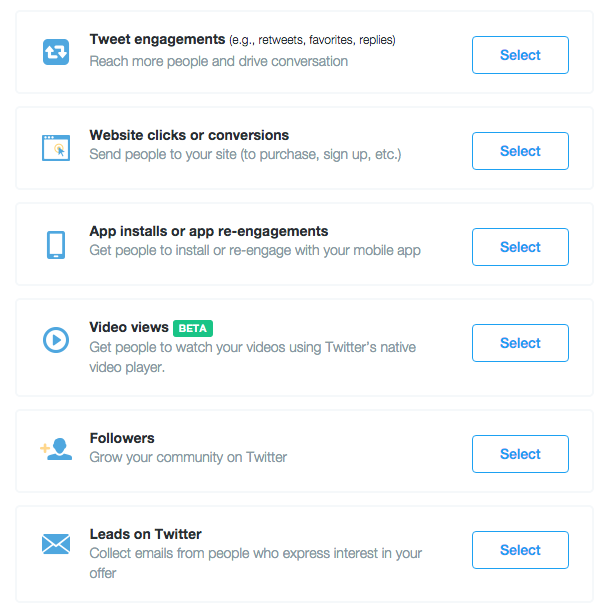 You can use the Tweet Engagements objective to push your Tweets to a wider audience. 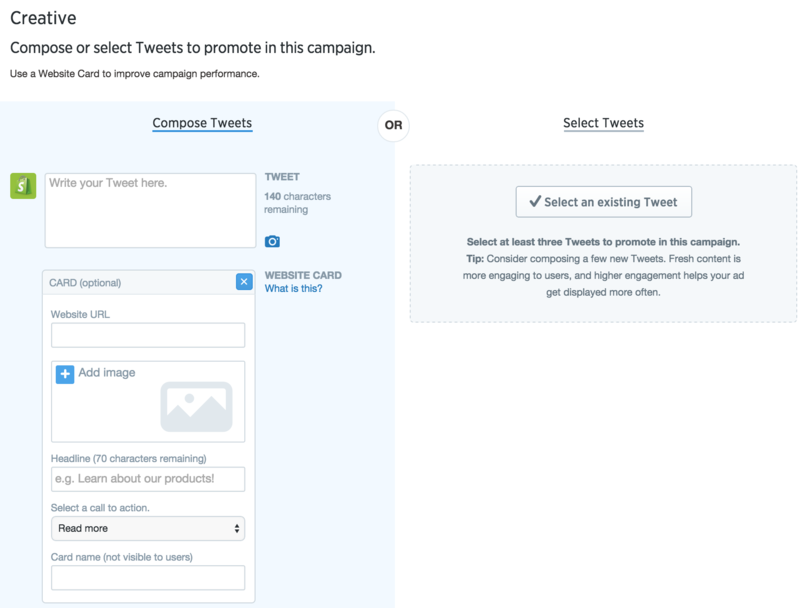 The Tweet Engagements setup page will allow you promote existing Tweets or create new promoted Tweets from scratch. The new Tweet you create can be published on your Twitter profile, or only displayed to those defined in your target audience. Promoted Tweets are priced on a cost-per-engagement (CPE) basis, meaning you’ll only pay when someone retweets, likes, expands, clicks on, replies to, or follows you from your Tweet. 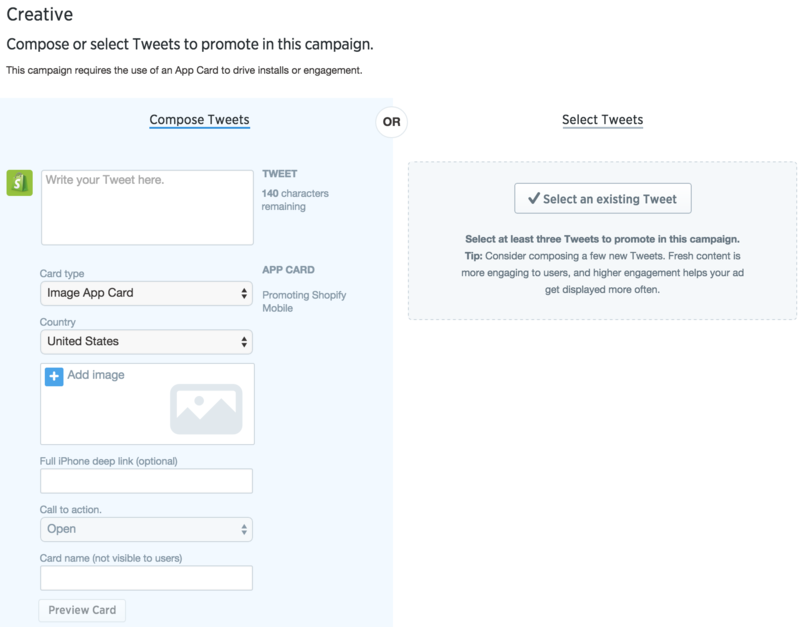 You can use the Website Clicks objective to push a Tweet including a Website Card to a wider audience. The Website Card encourages more clicks by providing additional details about your website, plus a call-to-action button to make it easier to visit. Calls-to-action include: read more, shop now, view now, visit now, book now, learn more, play now, bet now, donate, apply here, quote here, order now, and book tickets. The Website Clicks objective will allow you to promote existing Tweets mentioning your website or create new promoted Tweets from scratch. The new Tweet you create can be published on your Twitter profile, or only displayed to those defined in your target audience. Your budget will go towards clicks to your website from the Tweet or Website Card. You can use the App Installs objective to create a Twitter Card that encourages people to install your app. To use the App Installs objective, you will specify the app you want to promote by providing its URL from the app store it’s hosted on (e.g. the App Store or Google Play Store). Once you have selected your app, you can either select existing Tweets to pair it with or create a new Tweet from scratch. Calls to action include open, play, shop, book, connect, and order. Your budget will be allocated towards clicks to your app install page. Post a short video and get as many people to watch it as possible. While you may not be driving traffic to your website, video attracts attention and is often retweeted and liked. You can use the Followers objective to grow your community by encouraging Twitter users to follow you. To do so, you’ll need to tell people why they should follow your account. It’s good practice to only enter a single short sentence - no hashtags, links or anything that might distract your target audience from clicking the Follow button. Since obtaining a follower is the sole objective for this type of campaign, your budget should be based on the worth of a follower for your business. For reference, in 2013, Sumall did a study of 900 accounts that showed the value of a Twitter follower for brands was $25.62. You can use the Leads on Twitter objective to create a Twitter Card that encourages Twitter users to provide their email address, helping you grow newsletter distribution and potential-customer lists. Your call-to-action text will vary based on how you are attracting your leads. For example, if you want them to sign up for your newsletter, you could say Sign Up Now. If you are offering a free ebook, you could say Download Now. 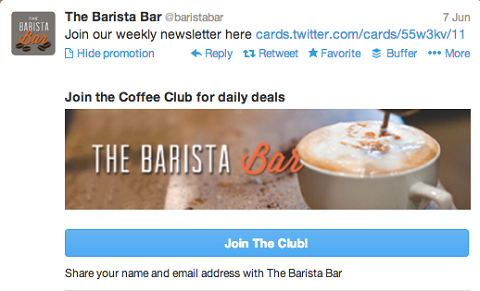 Once completed, Twitter users will then be able to submit their email address to you through the Lead Generation Card. Since obtaining a lead is the sole objective for this type of campaign, your budget should be based on the worth of a lead for your business. 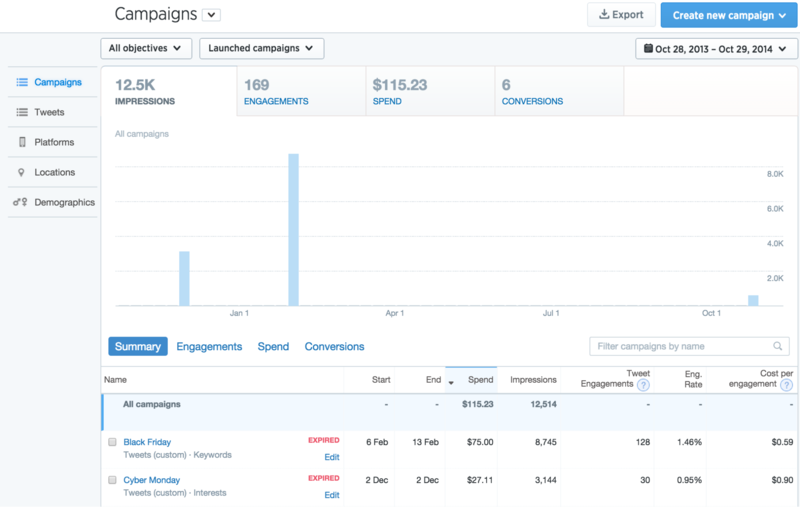 After running your first Twitter advertising campaigns, analytics details will be available through your Twitter advertising dashboard. Here, you’ll find additional details about each campaign’s performance. Be sure to monitor your campaign analytics closely to ensure that your advertising budget is well spent and gaining more engagement, clicks to your website, app installs, followers, or leads. In a 2016 earnings report, Twitter reported that it had a logged-out user base of 500 million. There’s no way to know if that’s actual Twitter users who just happened to be logged out or if they’re visiting Twitter without signing up. Of that logged out group, 65% of people who saw ads correctly recalled the ad; that’s 50% higher than a control group and quite valuable to your brand too.